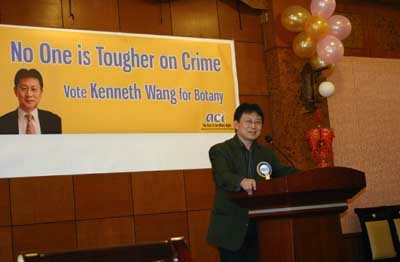 “No one is tougher on crime,” said the banner displayed behind the stage at ACT candidate Kenneth Wang’s Botany electorate campaign launch in the Jade Terrace restaurant last Sunday. 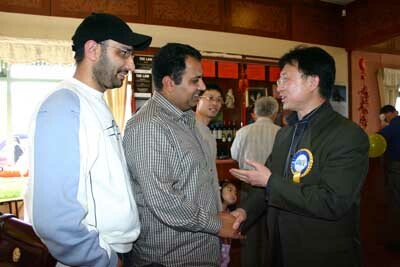 Mr Wang said he was one of the 15,000 angry protesters who marched in rain and hail on 5 July 2008 against violent crime. Mr Wang reminded the audience he has received a petition on the steps of Parliament in 2005 calling for action to get tough on crime and uphold victims’ rights. More recently, Mr Wang was the only political candidate besides ACT Leader Rodney Hide to visit Virender Singh, a small business owner charged by the police for defending his family and his property rights. Mr Wang said he was standing because he is determined to restore New Zealand to a country that is safe for families and where businesses can thrive. With credentials as a successful businessman, father of two and a consistent advocate for safe communities, Mr Wang made an impassioned plea for the electorate vote that would make him Botany’s parliamentary representative. For this to happen, it was important that Botany voters voted for him rather than Ms Wong, said Mr Wang. “My main opponent will be in Parliament whether you vote for her or not. Therefore, a vote for her is an entirely wasted vote,” he said. With signs the nation was looking for change, Mr Wang reiterated that only an increase in the number of ACT MPs in Parliament will ensure an “unshakeable resolve” to bring about a genuine change in direction, and the delivery of policies to deal with the community’s most pressing needs like greater public security and individual safety from crime.